I cannot believe you are already one week old. It’s been a whirlwind of a week in your little life! You were born early in the morning last Thursday, and by Friday afternoon we were already at home as a family of three for the very first time! Then again, everything you do is pretty darn cute. Your Grandma and Grandpa V drove all the way from Minnesota to see you, and since they arrived on Monday night, we have spent pretty much all day, every day just staring at you and your beautiful blue eyes. You are so perfect. At your first check-up with the peds doc, everything looked great. Your height was 20.75″ (94.25%), though she said you obviously didn’t shrink from the 21″ you were born at, so you were probably just fighting being stretched out. 🙂 You weighed in at 7# 14oz (66.83%), which means you were down only 4oz since birth. Not bad!! We’re working every day on getting you filled up with breast milk so that you’re back up to your fighting weight as soon as possible. We had some issues getting you to eat in the hospital, but ever since we got home, you’ve been a champion eater, though sometimes I need to work hard to keep you awake. Your head circumference was 13.25″ (31.38%)… she said that was totally normal, and as your brain grows, your head will keep expanding. That is pretty darn cool. Starting Monday you’ve been a little yellow, but we’re getting you as much sunbathing time in as we can. Between that and your good eating habits (about every 3 hours), we’re optimistic that the jaundice will be all cleared up by your next appointment this coming Monday! Yesterday your umbilical cord stump fell off at only six days old, and as excited as I was, I was a little sad that your final physical connection to me and your first home was gone. It did a good job nourishing you for nine months though, and I’m eternally grateful for that. More than anything, I want to tell you how much I love you. Every day, every hour, every minute, every second… it’s amazing to me how the first thing I think of when I wake up is YOU, and the last thing I think about before I go to sleep is YOU. If you’re making noises in the middle of the night, I love nothing more than to pull you from the cosleeper and cuddle up close with you. The other night your Daddy took you to bed before I went up, and when I got up there you were fast asleep on his chest (with him fast asleep and snoring beneath you!). Our love for you knows no bounds. I cannot wait to see how much you grow and change little one. I love you. 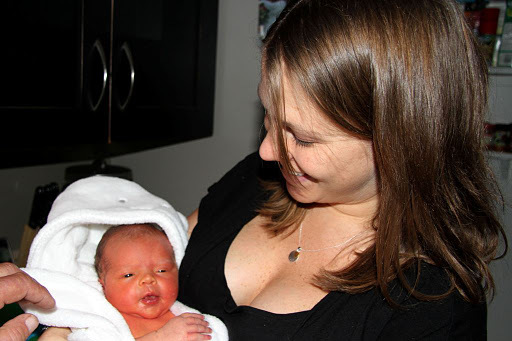 Happy 1 week Stella and Mom! 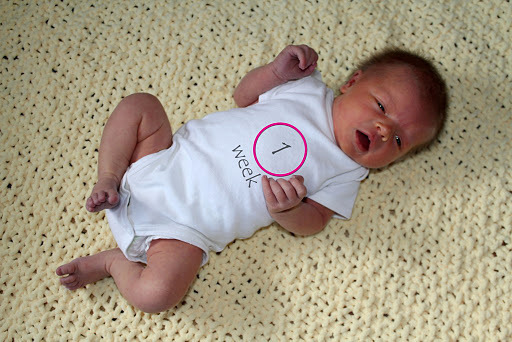 Happy one week baby Stella! 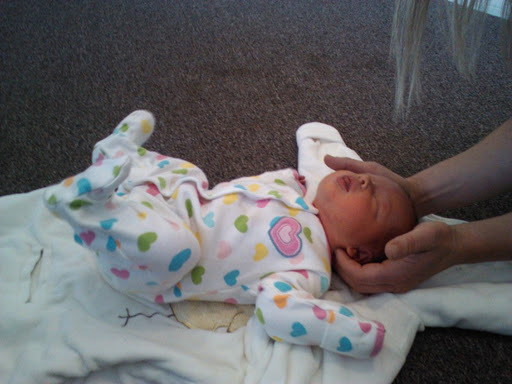 I didn't even know babies can get chiropractic adjustments. Oh the things I learn from you Josey! Awwww, you're first stranger-tear-inducing letter to Stella 🙂 We have that same bath and it seems like another life ago that we bathed Gracie in it! this brought tears to my eyes. So, so happy for you. Isn't it just amazing when they fall asleep on your partner's chest?? Those are some of my favorite moments of life. Ever. The happiness you express is magical. So wonderfully happy for you. We read your birthing tonight together. I am so proud of you! And the detail was amazing! I am also glad BC hubbie is not sold on the hypnobirthing thing yet (have not gone to classes) so I'm glad we got a chance to see how well it can work for someone. Yours is the first birthing story not to mention pain. Amazing. And the fact that YOU took her out of yourself????!!!! Never heard of such a thing…still in shock….that was the best part. I just love this and that picture of her in the swing and you just watching her… so sweet.So happy for you!! Beautiful words and a beautiful, beautiful daughter. Oh my gosh, oh my gosh, oh my gosh!!!!! She was early! I just spent about the last 30 minutes reading Stella's birth stories. As I sit here all teary eyed I just find myself so excited for you and your husband! I should have checked in on you earlier! Josey, she is absolutely perfect and the calm way you handled yourself through everything speaks volumes about you as a mama. What an awesome way for her to enter the world! Kudos to your husband for only missing one turn on the way to the hospital! 🙂 What a great gift to have her in your arms for Christmas. I don't have to tell you to savor every moment because I know you already are. My heart is just so happy for all of you. 🙂 Yay!!!! !